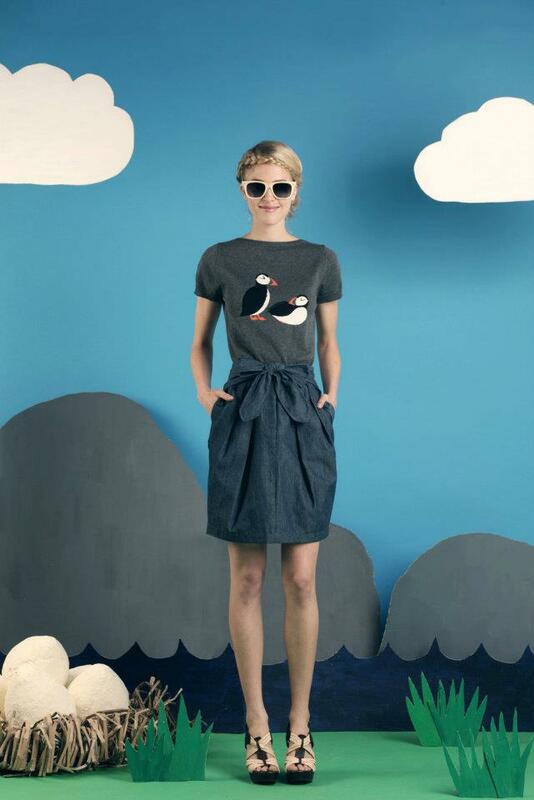 Bonjour Singapore: Fashion blog with a focus on Asia: Hansel A/W12: Perfect Puffins! The reason is simple, apart from being extremely colourful (a huge plus for me! ), it has a very distinct identity and it is one of the few homegrown labels which has managed to get a mass appeal beyond the usual ‘fashion crowd’ and find its way into the homes of ordinary Singaporeans who pick it up for its easy and cute appeal. Taking inspirations from various unpredictable objects and themes (my favourite was the previous Kueh Lapis cake-inspired ‘Tiers of Joy’), Hansel keeps proving that fashion does not have to be trend-driven or timely but more of a self-expression, a certain style which reflect the wearer’s character and mood. Their latest collection ‘The Puffin’ which is launching this coming Monday (August 20) is no different. It’s cheerful, fun, unpretentious and embodies that whimsical feel which the label is now synonymous with. this printed dress is spot on. Fun and effortless. Look2: Yellow is my favourite colour! This dress is so comfortable yet chic! A lot of local labels do edgy and trendy and Hansel doesn’t try and compete with that. On the contrary, it creates a niche for itself for being stylish, wearable and practical and as far as I’m concerned it succeeds in that. Jo Soh, the designer and founder of Hansel label explained to me the thought and design process which goes behind each garment and helped in Hansel's sucess. She says: 'When I design, I always consider first where the garment would be worn (as in, at work or for casual weekends or for cocktail parties), then I think about what features that garment needs to have in order to be appropriate for that environment, then I consider the different body types, then I look at the whole thing and ask myself if it's hansel. We edit out a lot of design ideas before we settle for the final ones that you see in the shop! I am personally particularly proud that our customers' age range is expanding, from the target 25-35 years old, to include women in their 40s and 50s. The new collection is full of cute dresses, cheerful Puffin prints and beautiful shades from fun and flirty blue, purple and yellow to work-friendly grey, black and white. I absolutely fell in love with it! more so when I went to the boutique yesterday to try the pieces for myself. The quality was also outstanding, whether the cute super comfy printed Hello Hansel frocks, or the more understated structured and peplum dresses which look so chic and fit perfectly. I was very impressed! where the shape is also inspired by the puffin's feathers. The fit of the dress was perfect!!! I felt so elegant in it. Look 4: This knit dress is soooo comfy! Again loving the peplum! By Invite Only for Hansel's new collection? Apart from apparel, the label is also known for the cute accessories which accompany each collection and are usually the first thing to get snapped up. For ‘The Puffin’, Hansel has collaborated with Trixie Khong from By Invite Only label to create an array of beautiful accessories that go with the collection. And she couldn’t have picked better! I love the cute and slightly dainty golden sets featuring fish and puffins, but my favourite ppiece has to be the statement feather necklace which is really hard to miss! In total I tried 6 looks from the new collection yesterday. I would have definitely tried more but not all the pieces had arrived especially the knit dresses which judging by the campaign images look too adorable! But still with the ones I managed to try, the result was a big dilemma on what to bring back home as everything looked gorgeous and fit very well. Comfortable and stylish, I couldn’t have loved this collection more! The official launch of the Puffin collection in on Monday, the 20th of August but some of the pieces are already available at the Hansel shop in Mandarin Gallery #02- 14, Orchard Road. You can also shop the collection online soon, and follow them on facebook and twitter for the latest updates. are not yet in store until Monday!